Thanks to the Chipotle-ization of our food system, you can get burritos, pizza, rice bowls, salads, and frozen yogurt fully customized at the whims of your pointer finger. 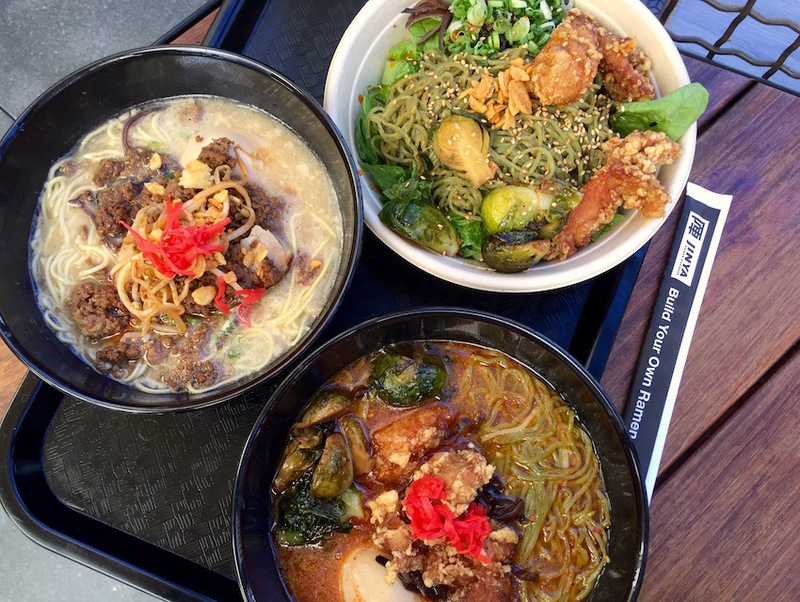 And at long last, that model of edible efficiency has spilled over into our beloved bowls of ramen at JINYA Ramen Express, a teensy, counter-only, quick-serve spot that recently opened at the Hollywood & Highland complex. But just because it works for a carnitas bowl or mini pizza, can it work for tonkotsu? One slurp and we’re pretty sure the answer is a resounding YEAH, HEY, WHY NOT? Choosing your own ramen adventure isn’t completely novel. At just about any ramen shop anywhere, whether it’s in Little Tokyo or, you know, Tokyo, you get to choose what you want in your bowl. There’s a menu and basically a check-list of what kind of noodles, broth, and toppings you want; maybe it’s a piece of paper, like at Shin Sen Gumi, or an iPad, as used at Tatsu on Melrose. You order, someone brings you a bowl of steaming hot ramen, you slurp. Easy. But JINYA Ramen Express, an offshoot of the growing company that landed in Studio City in 2010 and now has 11 locations in the U.S. and Canada (some are franchised), has gone the full-on Chipotle route: Build your own bowl by ordering at a counter and choosing what kind of noodles, broth and toppings you want as you move down the line. The menu is pretty small, with only two kinds of noodles, Jinya’s signature aged thin noodles or pale green spinach noodles; three broths, including the rich, porky tonkotsu the brand is known for, plus a spicy chicken broth or a miso vegan option; and a variety of proteins, from thick slabs of chashu pork to ground chicken or pork saboro, big chunks of silky mapo tofu, grilled chicken, or the crispy karaage chicken. Top it off with any number of vegetables and other toppings. But be careful. Like Chipotle, or any restaurant where you can order a meal your way while watching it being made, things can get unwieldy because everything sounds good. Sure, there’s the classic ramen with tonkotsu broth, chashu pork, soft egg, scallions and crispy garlic. But there’s also spinach ramen in spicy chicken broth with crispy chicken, corn, mushrooms, spicy sprouts and Brussels sprouts. That’s right…Brussels sprouts. We have no idea how those got in there, but no one’s kicking them out of that ramen bowl. Because it’s kind of tasty. And just like the Chipotles, PizzaRevs, or Yogurtlands of the world, for the people who just can’t handle so many options, there are pre-set soups, rice bowls, and even a cold, broth-less ramen salad at JINYA Express. That salad comes with spinach noodles on a bed of crisp romaine lettuce with cilantro, corn, tomato (?! ), grilled chicken, spicy chile oil, sesame sauce, and sesame. The rice bowl is filled with brown rice, cilantro, tomato, Brussels sprouts, pork saboro, grilled chicken, egg and sesame. They’re made fast, which seems to keep the local lunchers happy, or any tourist who finds their way up there. The space is hidden deep within Hollywood & Highland, which is really like a maze. But if you’re familiar, it’s located on the third floor dining deck right next to an entrance for the TCL Chinese Theatre. Once you have your bowl of noodles, there are a few tables right there with seats overlooking the Hollywood Boulevard craziness below. You don’t get Batman and tonkotsu just anywhere, you know. The restaurant is open daily from 11am-10pm.